The Rio Grande Valley, often referred to as Rio South Texas, offers many choices for both global business location and generous economic development incentives. With a dynamic young labor force, great weather, low cost of living and plenty of recreational activities year round, the Rio South Texas region is an ideal location for companies looking to expand or relocate. 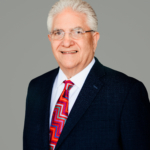 For several decades, business leaders across the Rio Grande Valley have advocated taking steps to combine the Metropolitan Statistical Area designations for McAllen-Mission-Edinburg with Brownsville-Harlingen into a Consolidated Metropolitan Statistical Area. The idea behind combining the two Valley MSAs is rooted in the theory that the whole is greater than the sum of its parts. The McAllen MSA, with a 2015 population of 842,304, is the fifth largest MSA in Texas. It ranks ahead of El Paso and 66th in the United States, according to the U.S. Department of Commerce Bureau of Economic Analysis. The Brownsville MSA ranks eighth in Texas as well as 103rd nationally, based on the U.S. Census 2015, with a population estimate of 422,156. With a total estimated population today of approximately 1.35 million in the two MSAs, a combined McAllen-Brownsville area would move up the rankings to 46th in the nation. This is without including Starr or Willacy counties in the equation. The combined MSA would still rank fifth in Texas, but would put substantial distance between the Valley and sixth-ranked El Paso. The potential impact of combining Valley MSAs on business and government is difficult to measure, but the data does shed light on the merits of the case. The U.S. Office of Management and Budget defines MSAs according to published standards that are applied to Census Bureau data. The general concept is to identify a core area with a substantial population consisting of adjacent communities that have a high degree of economic and social integration. Within Texas the Valley competes with the rest of the state for government dollars to fund everything from economic development to infrastructure improvements. The data reflected in an MSA includes not only population but statistics on the workforce, transportation, income and much more. That information paints a picture of a region that can conceivably give it more clout to influence decisions made by the public and private sectors. The statistics also provide valuable demographic data to businesses looking to enter the South Texas market. 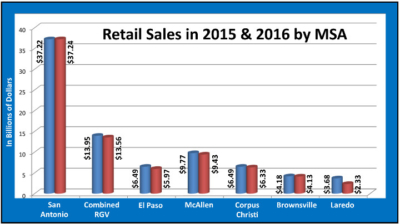 In looking at retail sales as a measure of relative ranking of a combined Valley MSA, one need only look at the Valley Retail Sales graphic. 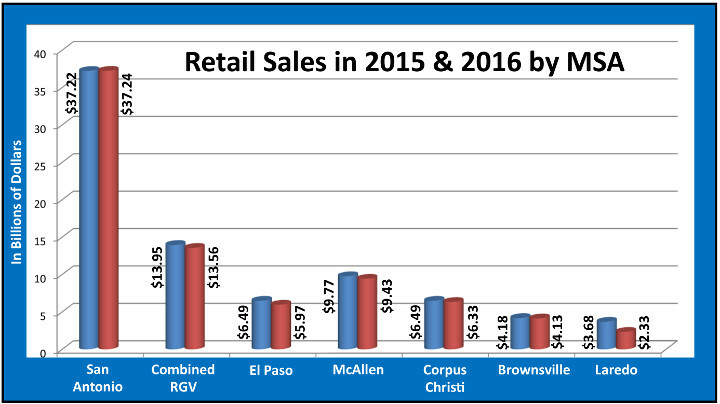 Notice how the Valley totals compare to El Paso, Corpus Christi and Laredo in 2015 and 2016. The Cameron County Regional Mobility Authority commissioned a study in 2010 to illustrate the potential impact on the binational region, including both sides of the U.S.-Mexico border in South Texas. 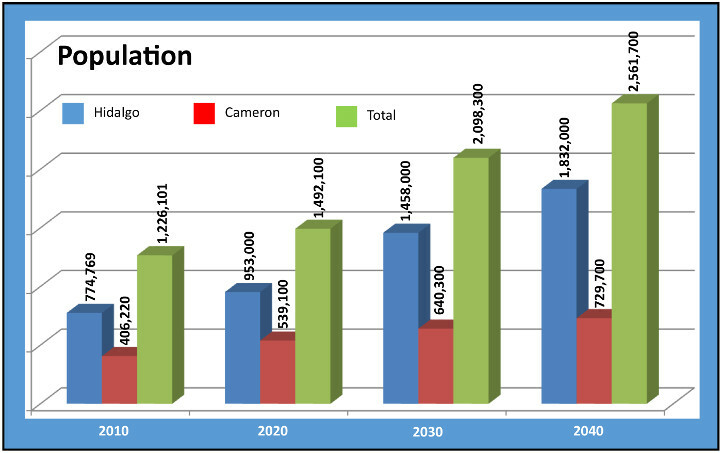 The data presents a compelling picture of what the region might look like in 2040. At this time, the population is projected to reach seven million people, 3.5 million more than we have here today. There are some South Texas officials that worry in a CMSA, individual communities would lose some degree of influence and get lost among their larger neighbors, proponents argue that all of South Texas would become more competitive for private sector investment and government funding. The Rio Grande Valley is poised for growth. It has a young and able workforce, in addition to expanded educational facilities at the University of Texas Rio Grande Valley, Texas A&M, Texas State Technical College, South Texas College and Texas Southmost College. The Valley boasts ample land available for development, water resources, interstate highways, improved electrical grid. It now ranks seventh in cross-border trade among the nation’s 165 land ports of entry. With the 2020 Census just around the corner, the time has come for the Rio Grande Valley to give a hard look at combing the McAllen and Brownsville MSAs to fully establish the region as the economic powerhouse it has become. Partner and Managing Broker NAI Rio Grande Valley, and member of the NAI Global network, the largest commercial real estate brokerage network in the world with affiliate office in 375 markets and 55 countries. NAI Global now owned by C-III Capital Partners LLC. Member of the NAI Global Leadership Board.